Democratic National Committee chairwoman Debbie Wasserman-Schultz appeared on Fox News Sunday and defended the recent attack ad by Democratic Super PAC Priorities USA Action. She said that she had “no idea” what the political affiliation of the people associated with the organization is. Host: Do you deny that they’re Democrats? DWS: I have no idea of the political affiliation of the folks associated with that Super PAC. Host: So, Bill Burton, who used to work in the White House, who worked for the Obama campaign in 2008? Not a Democrat? 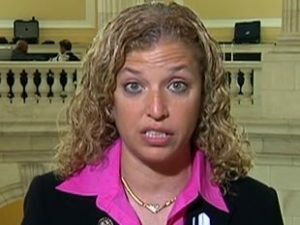 DWS: That is a Super PAC ad, not affiliated with the party or the campaign. Not only did she not directly answer the question, she lied about her knowledge of what party affiliation Priorities USA has. Burton has staunchly defended the ad and disagrees with the criticism that the ad leaves viewers with the impression that Mitt Romney was responsible for the death of steelworker Joe Soptic’s wife from cancer. Burton has publicly boasted that the ad has been “wildly successful,” having garnered millions in free air time. Yet evidence in the form of a recording surfaced last week that the Obama campaign had hosted a conference call in May during which Soptic told reporters the same story that was featured in the controversial Priorities USA ad, despite denials from the campaign that they had any knowledge of the Soptic story. Yeah, right. Just another Democrat caught in another lie.